Clair Archer was a founder member of the Canadian team in 2006 and exemplified the voluntary nature of both the organisation and his personal commitment to helping other people. International and local Muscles members salute the commitment and dedication of this true Canadian ambassador. To date, and with Clair’s help, Muscles for Charity has completed over 200 projects, generating finance and awareness for over 80 registered charities in seven countries. 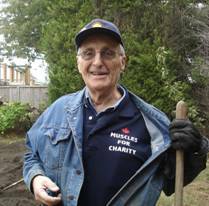 Members of Muscles for Charity teams in the UK, Belgium, the USA and Canada are deeply saddened by the loss of a respected and valued friend and send our condolences.